Couselo J.L., Vela P., Salinero C, Mansilla P.
Ciborinia camelliae is the causal agent of Camellia Flower Blight (CFB), a disease that affects flowers of Camellia genus. It is regarded as the main phytosanitary problem affecting camellia flowers. Infection is initiated only by the ascospores (a type of spore formed in a structure known as asci). These spores are formed in the apothecia, which are structures with mushroom appearance that are developed from the sclerotia found in the soil. Each apothecium produces several millions spores that are spread in the environment until they reach the surface of the camellia petals where the infection is initiated, leading to flower blight. The infection often develops through the petal until it reaches the base where sclerotia are formed (the sclerotia are the structures of fungal resistance). When the flowers fall to the ground the sclerotia also fall. These resistance structures of the fungus stay dormant until the next blooming period when they activate again. Then new apothecia are developed from sclerotia and the fungus cycle continues causing new infections (Mansilla et al. 1999) (Figure 1). Control of CFB by using chemicals and biological control agents (BCAs) on sclerotia and flowers so far has not proved to be effective. However, only a few specific tests on their effect on mycelium, sclerotia and ascospores of C. camelliae have been performed. In the present work different strategies for disease control have been developed in order to interrupt, at some stage, the life cycle of C. camelliae (Figure 1). Different in vitro tests have been carried out to evaluate the effect of several chemicals and BCAs (Table 1) on spore germination, mycelium growth and viability of fungal sclerotia. At the same time, their effect was also tested in ex vitro conditions A brief review of the tests carried out at Estación Fitopatolóxica do Areeiro (EFA) over 24 months aimed to assess the efficacy of different control strategies of CFB is presented. Figure 1. 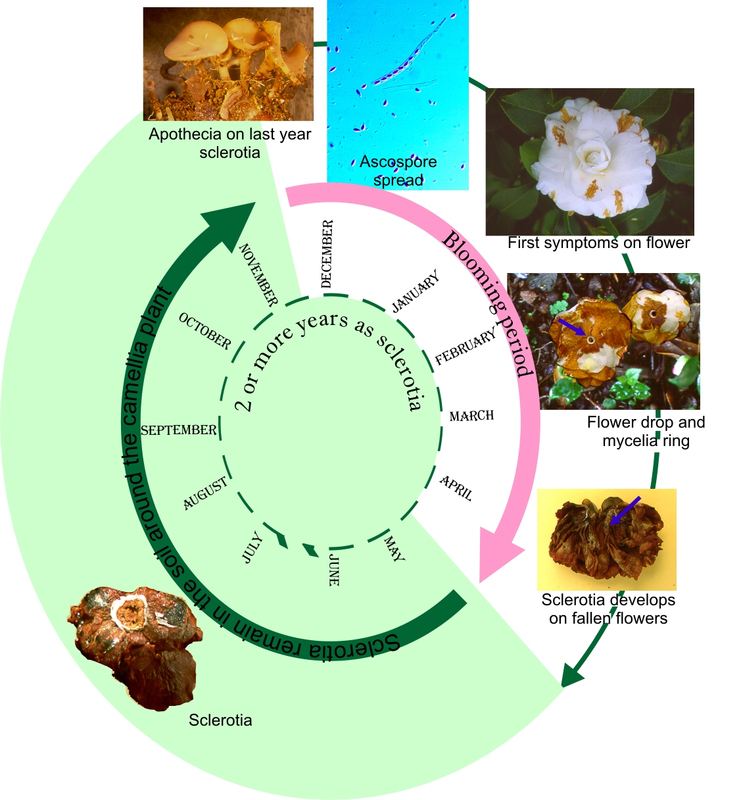 Life cycle of C. camelliae, causal agent of CFB. We evaluated the in vitro effect of three different chemical fungicides (Table 1) on C. camelliae spore germination and mycelium growth. The test was carried out using PDA plates amended with increasing amounts of fungicide (0, 10, 100 and 1000 ppm). Ascopores were recovered from field-collected apothecia. Mycelium was obtained from monosporic cultures maintained in PDA. 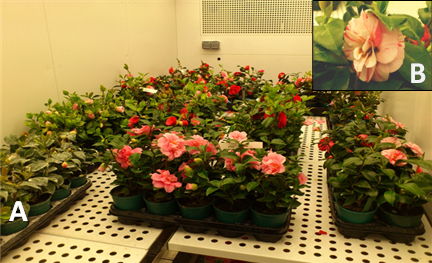 Ten different strains of C. camelliae were used with each tested fungicide. PDA plates were then incubated at 20°C in the dark for 4 weeks. After this period spore germination rates as well as mycelium growth were determined in each treatment. The ability of B. mojavensis to control growth of C. camelliae mycelium was tested in vitro using strain ATCC 51516. Bacteria were spread on PDA medium together with C. camelliae. Fungal mycelia from 10 different monosporic cultures were used. The co-culture was incubated in the dark at 20°C. Fungal mycelium growth was recorded weekly for 8 weeks. 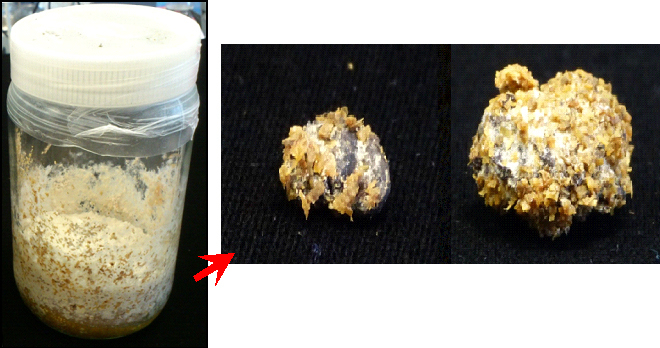 The ability of P. chrysosporium to degrade the protective outer coating of sclerotia was evaluated. P. chrysosporium (CECT2777) was grown in a sterile mixture made of pine sawdust amended with rye flour (3:1 w/w). Then sclerotia of C. camelliae were added to the mixture. Degradation of the sclerotia outer shell was estimated by a penetration test after 4, 8 and 12 weeks (van Toor 2002). Tests 4, 5 and 6 were carried out in climatic chambers at 20°C and 85% RH. Photoperiod consisted of light/dark cycles of 12:12 at constant PAR (300 µmol/m-2s-1) using 58 W lamps model SYLVANIA GRO-LUX®. The control of CFB by intensive application of chemical fungicides was studied. Five C. japonica cultivars were evaluated using 10 plants of each cultivar per treatment, each plant containing from 5 to 8 flowers. Chemical fungicides (Table 1) were applied once a week for 12 weeks (maximum recommended dose). 24 hours after each application a C. camelliae ascospore suspension was sprayed on the camellia plants. Ascospore suspension concentration was 5•105 spores/mL. Fungal incidence was determined during the test. At the end of the test, the number, size and weight of sclerotia were also determined. Statistical data analysis was performed by two-way ANOVA (fungicide treatment and camellia cultivar) for p <0.05 using the statistical software SPSS 15.0. The mobility of chemical fungicides (Table 1) through the plant and their ability to protect the flower against CFB was investigated. Cut flowers (30-35 cm in length) from five cultivars of C. japonica were used, selecting at least 10 flowers per cultivar and treatment. As a marker of petal transpiration different food dyes were used, all of them harmless to plants. Cut flowers were placed in solutions containing different chemical fungicides (at the maximum concentration recommended by the manufacturer). 24/48 h hours later, flowers were sprayed with a C. camelliae ascospore suspension (5•105 spores/mL). Fungal incidence was determined during the assay. At the end of the test, the number, size and weight of sclerotia were also determined. Statistical data analysis was performed by two-way ANOVA (fungicide treatment and camellia cultivar) for p<0.05 using the statistical software SPSS 15.0. Non-sterile substrates were sown with C. camelliae sclerotia to assess the effectiveness of P. chrysosporium (CECT2777) and Remedier® against sclerotia germination. Remedier® was applied at a dose of 2.5 kg/ha. P. chrysosporium was applied as activated substrate at a dose of 2500 and 10000 kg/ha. P. chrysosporium activated substrate was obtained by culturing the fungus in a sterile mixture of pine sawdust amended with rye flour (3:1 w/w) for 8 weeks at 22 °C in darkness. This was added to the non-sterile substrate used in Test 6. The number of germinated sclerotia was recorded for each treatment. Statistical analysis of data was performed by one-way ANOVA (BCA treatment) for p <0.05 using the statistical software SPSS 15.0. The effect of chemical fungicides and BCAs (Table 1) against sclerotia formation on fallen camellia flowers was evaluated. Flowers from 10 different cultivars were used in the trial, with a total of 40 to 50 flowers per treatment and cultivar. These flowers showed symptoms of infection with C. camelliae but no sclerotia. Flowers were placed in a shaded area with 65-97% RH. Chemical fungicides and BCAs were applied once a week by spraying. Manufacturer´s maximum recommended dose was used. Effect on number, size and weight of sclerotia was determined after 18 weeks. Statistical analysis of data was performed by two-way ANOVA (fungicide/BCA treatment and camellia cultivar) for p <0.05 using SPSS 15.0 statistical software. 37 camellia shrubs aged from 20 to 30 years, with a trunk diameter between 7 and 18 cm and belonging to 17 cultivars were selected for Tests 8 and 9. Chemical fungicides (Table 1) or the BCA B. mojavensis ATCC 51516 (2•106 CFU/mL) were injected into 31 shrubs. The injections were performed three times (May, September and November) with the trunk injection system Quick-Jet Pro Kit ArborJet. A weekly monitoring of the incidence of the disease throughout the blooming period was performed. In each camellia shrub two separate branches, at 180° (North and South oriented), each containing from 20 to 40 completely closed buds, were labelled. Branches were covered with a mesh of 1x1 cm square grid. Daily monitoring was conducted to collect the fallen flowers from the meshes. Flowers were removed from the mesh and stored in a closed chamber (at 20 ° C and 80% RH). 18 weeks after the collection, number, size and weight of sclerotia was determined. Statistical analysis of data was performed by two-way ANOVA (fungicide/BCA treatment and camellia cultivar) for p <0.05 using SPSS 15.0 statistical software. The aim of Test 10 was to assess the effectiveness of P. chrysosporium and T. gamsii + T. asperellum (Remedier®) against sclerotia germination under field conditions. Thus, in autumn, nine experimental plots (0.5 m2) were sown with sclerotia. In each experimental plot the corresponding BCA was added (except controls). P. chrysosporium was applied as an activated substrate at a rate of 10000 kg/ha. Remedier® was applied following manufacturer's specifications at a rate of 2.5 kg/ha. The number of apothecia per plot was determined weekly during winter and spring. Statistical analysis of data was performed using one-way ANOVA (BCA treatment) for p <0.05 using the statistical software SPSS 15.0. Table 1. Chemical fungicides/BCAs used in different tests against C. camelliae (ascospores / mycelial growth / sclerotia). Superscripts indicate the test in which each product was used. Cyprodinil is a fungicide that inhibits the biosynthesis of aminoacids and interferes in the processes of transportation of the plasma membrane. Fludioxonil blocks a protein kinase that catalyses the phosphorylation of a regulatory enzyme of glycerol synthesis. The combination of both ingredients inhibits spore germination, the growth of germ tubes, and the penetration of the fungus inside the plant and the growth of internal mycelium. Fungicide that blocks the respiratory chain complex II, thus inhibiting spore germination, elongation of germ tube, mycelium growth and sporulation. Fungicide that binds to the Complex III of the mitochondrial electron transport chain, interrupting metabolism and avoiding germination of spores and the early stages of development of several fungi. Broad-spectrum fungicide that interferes in the respiration process thus inhibiting spore germination and hindering mycelium growth and development. Both active ingredients block cell respiration although in different stages. They inhibit spore germination, elongation of germ tube, mycelium growth and sporulation. Azoxystrobin affects cell respiration, interrupting the metabolism, avoiding spore germination and early stages of development of several fungi. Cyproconazole alters the biosynthesis process of sterol, thus inhibiting mycelium growth. It interferes in the biosynthesis and DNA translation. Impedes development of germ tube, appressoria formation and mycelium development. It alters the biosynthesis process of sterol, inhibiting the mycelium growth. Trifloxystrobin affects cell respiration, interrupting metabolism and altering spore germination and early development of mycelium. Tebuconazole alters biosynthesis process of sterol and also inhibits mycelium growth. It causes toxicity in several microorganisms, by poorly known mechanisms. Cymoxanil affects RNA synthesis, inhibits spore germination and mycelium growth. Copper substitutes other essential metals for the life of microorganisms in infinitesimal quantities, inhibiting their development. It hinders spore germination. Inside the plant this fungicide is transformed into a phosphorous acid that is toxic to some fungi and triggers biochemical reactions of natural defense inside the plant (formation of phytoalexins and other phenolic compounds). C. minitans is a microparasite of some fungi developing sclerotia such as Sclerotinia sclerotiorum. T. atroviride is an antagonistic fungus of some pathogenic fungi (Fusarium spp., Rhizoctonia spp., Verticillium spp., Armillaria spp., Phyrochaeta spp., Phytophtora spp., Botrytis spp. etc.). T. asperellum and T. gamsii are antagonistic of some pathogenic fungi (Fusarium spp., Rhizoctonia spp., Verticillium spp., Armillaria spp., Phyrochaeta spp., Phytophtora spp., Botrytis spp. etc.). P. chrysosporium is able to produce and secrete several peroxidases. These peroxidases are able to mediate in chemical degradation of a wide variety of organic compounds such as those present in outer coating of sclerotia. B. mojavensis is an endophytic bacterium antagonistic to some fungi. It has the ability to produce speciﬁc lipopeptide biosurfactants. Some of these substances such as surfactin A, are inhibitors to fungi, some bacteria, mycoplasmas, and viruses. Fungicides are considered effective when they are able to inhibit in vitro development of target fungi at a concentration less than or equal to 10 ppm. All chemical fungicides used (Table 1) inhibited spore germination and fungal mycelia growth at a concentration of 10 ppm except Thiovit Jet ®, Curzate C Blue ® and Aliette ®. Signum ® completely inhibited spore germination at 10 ppm but it required a concentration equal to or greater than 100 ppm to inhibit mycelial growth. Fungicides that inhibit spore germination could be applied by surface spraying to prevent the onset of infection on camellia flowers. Test 4 was performed to assess their effectiveness on camellia flowers. Effective fungicides against fungal mycelium could be used to control infections already established in flowers. Tests 5, 7 and 8 were performed to test their effectiveness. Figure 2. A, Switch® inhibiting spore germination. Growth of fungal colonies after 120 hours in PDA. A large number of white colonies (arrows) were observed in control plates, whereas none was observed in the PDA amended with fungicides. B, fungicides inhibiting mycelium growth. B. mojavensis is an endophytic Gram positive bacterium that has proven effective in controlling many fungal plant pathogens (Bacon and Hinton 2002, 2007). The use of endophytic bacteria to control plant diseases has been the subject of numerous studies in recent years (Backman and Sikora 2008). Nowadays, there are commercial fungicides like Serenade Max® (Bayer) based on the properties of endophytic bacteria like Bacillus subtilis QST 713. In Test 2, the presence of B. mojavensis ATCC 51516 in PDA medium completely inhibited the mycelial growth of all C. camelliae strains (Figure 3). This bacterial strain has shown great ability to colonize in vivo intercellular compartments of different plant tissues (Bacon and Hinton 2001) although it has never been used on Camellia. 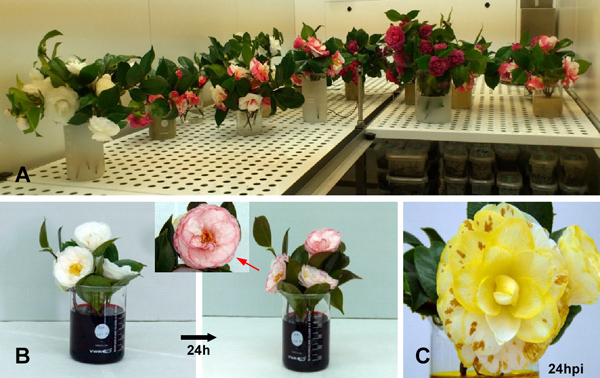 Test 9 was performed to test its colonization ability in Camellia as well as its in vivo effectiveness against C. camelliae. Figure 3. B. mojavensis inhibiting mycellium growth of C. camelliae after 72 h of co-culture in PDA (Right) and control (Left). P. chrysosporium is a white rot fungus that produces and releases enzymes into the substrate that can degrade recalcitrant molecules such as lignin or melanin. The main limitation to destroying the sclerotia of C. camelliae is the protective outer coating rich in melanin (Butler and Day 1998). Degradation of the protective outer coating is accompanied by loss of viability (van Toor 2002). In Test 3, the ability of P. chrysosporium to degrade the protective outer coating of sclerotia of C. camelliae was studied. After 4 to 8 weeks no significant differences were observed in the resistance of the protective outer coating between controls and P. chrysosporium-exposed sclerotia. Significant differences in resistance were recorded after 12 weeks. At that time, sclerotia surface was completely colonized by P. chrysosporium (Figure 4). 87% of sclerotia with weakened protective outer coating compared to 39% in controls were recorded. The effect of P. chrysosporium on sclerotia protective outer coating was very obvious after three months in the absence of other microorganisms. However, in field conditions this would only happen if the fungus develops easily on the sclerotia containing substrate. It has been reported that use of wood rotting fungi and pine mulches increased sclerotial mortality in vitro (van Toor et al. 2005) but this was not tested in field conditions. To study the ex vitro effect of P. chrysosporium Tests 6 and 10 were performed. Figure 4. C. camelliae sclerotia colonized by P. chrysosporium after 12 weeks (white mycelia on the surface of the sclerotia). As a result, the protective outer coating of sclerotia is partly degraded and it loses viability. Weekly application of chemical fungicides on blooming plants reduced the incidence of CFB by 20 to 30%. However, neither the number of sclerotia produced per flower nor their average size/weight was reduced. A reduction in incidence can be explained by the ability of the chemical fungicides used to control ascospores and the development of C. camelliae mycelium (Test 1). However due to the gradual opening of camellia flowers is impossible to achieve 100% coverage of the petals with fungicides. This would require daily treatments of each flower, which is not feasible. Sclerotia results suggest that absorption and mobility of fungicides in camellia flowers are very limited and so therefore their actual effectiveness is also limited. Test 5 and 8 were performed to check this. Figure 5. A, general view of the intensive application of chemical fungicides by pulverization. B, camellia flower (treated with Folicur®) showing symptoms of CFB one week after flower bud opening. This assay was performed to determine the acropetal translocation of several fungicides and their ability to protect the flower against CFB. Transpiration causes dyes to be apparent on the petals after only two hours. After 24 hours flowers were completely stained. However 24/48h after treatment, none of the fungicides used (Table 1) proved to be capable of protecting camellia flowers against C. camelliae infection. Fungal incidence, as well as number, size and weight of sclerotia was equal in flowers treated with fungicides as in controls. To study long-term effect of fungicides applied directly to the vascular system Test 8 was performed. Figure 6. A, cut flowers were placed in beakers containing solutions of fungicides and different dyes used as markers for plant transpiration. B, 24 hours later, the stained flowers were sprayed with a C. camelliae spore suspension (5•105 spores/mL). C, brown spots caused by C. camelliae 24 hours post inoculation. The effect on the number and weight of sclerotia was determined after 18 weeks. P. chrysosporium and several fungi of the genus Trichoderma have been shown to be capable of reducing the viability of C. camelliae sclerotia when in vitro tests were performed (Test 3, Montenegro et al. 2010). In Test 6 the effectiveness of these BCAs in ex vitro conditions and in a controlled environment were evaluated. Apothecia developed from week 17 to 27 after the sowing of sclerotia. No significant differences in the number of developed apothecia between BCAs-substrates and controls were detected. Despite the large amount of P. chrysosporium in the initial inoculum, after two weeks it was found that other microorganisms present in the non-sterile substrate replaced the fungus. However, in Test 3 (in vitro) at least 12 weeks were necessary for effective sclerotium protective outer coating degradation. In Test 6 this does not happen because P. chrysosporium is less competitive than other microorganisms, explaining the lack of effectiveness of P. chrysosporium. On the other hand T. asperellum and T. gamsii (Remedier ®) by themselves are not able to damage the sclerotia protective outer coating and have not been effective in parasitizing the stipe of C. camelliae apothecium (in the onset of apothecia germination). To evaluate the effectiveness of both BCAs in field conditions, Test 10 was performed. Figure 7. Non-sterile substrate sown with sclerotia to assess the effectivity of P. chrysosporium and T. asperellum + T. gamsii (Remedier®) against sclerotia germination. A, immature apothecia from substrate inoculated with P. chrysosporium after 17 weeks. B, immature apothecia from substrate inoculated with T. asperellum + T. gamsii after 18 weeks. Prior to the formation of sclerotia, a grayish-white mycelium at the base of the petals (Figure 8B, 8C, 8D) can be observed. This test attempted to determine whether sclerotia formation could be interrupted by spraying fungicides and BCAs (Trichoderma and Coniothyrium) on fallen flowers. 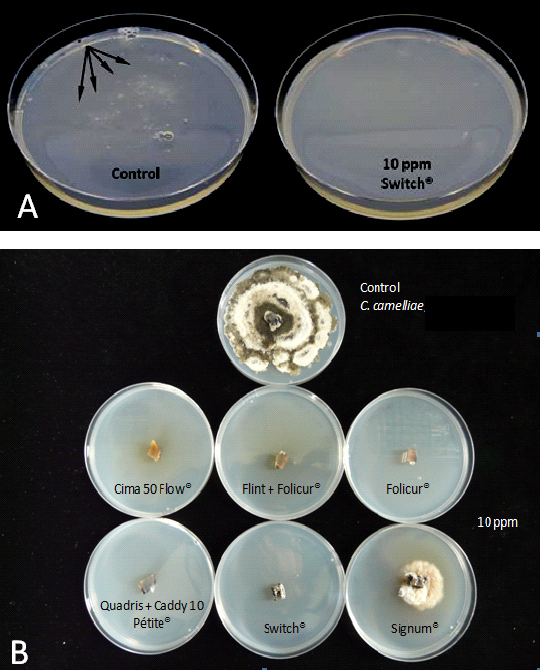 Chemical fungicides proved capable of inhibiting in vitro mycelial growth of C. camelliae (Test 1, Table 1). However, none prevented the formation of sclerotia in the flowers. BCAs also failed in preventing the formation of sclerotia. The number, size and weight of sclerotia did not differ significantly between treated and control flowers. These results suggest that applying fungicides or BCAs to the mycelial ring is not an effective strategy to control the disease since the fungus is able to complete its life cycle. Figure 8. 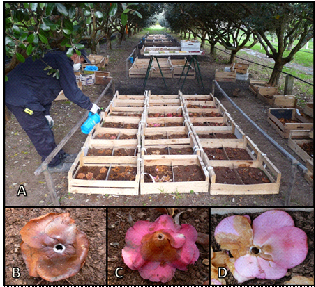 A, application of chemical fungicides and BCAs on camellia flowers before the sclerotia development. Those flowers presenting sclerotia were not included in the assay. B, C, D, grayish-white mycelium at the base of the petals. Plant endotherapy consists of injecting the phytosanitary products into the trunk, which are then distributed throughout the vascular system of the plant. The system provides an alternative for the treatment of trees as substances going directly into the tree are more efficient and do not pollute the environment. In Test 5, the fungicides failed to prevent petal blight when they were applied for a short period of time. To determine the efficacy in a long-term treatment, Test 8 was performed. Different fungicides were injected into camellia shrubs (Table 1). After 9 to 11 months, the treatment did not significantly reduce the incidence of CFB nor the number, weight and size of sclerotia compared to controls. The fungicides used in Test 8 are described as systemic. We previously established the fungal growth inhibition by these fungicides (Test 1). Systemic fungicides are theoretically taken up and redistributed through the xylem. However, they do not reach the camellia flowers. Endotherapy has proven effective against some fungal diseases such as apple scab (Venturia inaequalis; Percival and Boyle 2005) or Phytopthora (Guest et al. 1995) but it does not seem an effective technique for controlling CFB. B. mojavensis has proved capable of inhibiting the growth of C. camelliae in vitro (Test 2). However, spraying the camellia leaves and flowers with a bacterial suspension (2•106 CFU/mL) was not effective in controlling the disease (data not shown). In Test 9, bacteria were inoculated by trunk injection to evaluate its effectiveness in controlling CFB. After 9 to 11 months, B. mojavensis did not significantly reduce the incidence of CFB nor the number, weight and size of sclerotia compared to controls. Furthermore the bacteria could not be re-isolated from the camellia flowers. This suggests that the internal colonization of the camellia plants has not been successful (at least after 8 to 10 months). Figure 9. Plant endotherapy. Trunk injection (Quick-Jet Pro Kit ArborJet) with chemical fungicides or with the endophyte bacterium B. mojavensis. During the flowering season (mid-winter to mid-spring), some branches were covered with a mesh of 1x1 cm square grid. Daily monitoring was conducted to collect fallen flowers. As in the Test 6, no significant differences were recorded in the number of germinated apothecia between the BCAs-treated and the control plots. In field conditions, P. chrysosporium does not seem to compete effectively against other soil microorganisms. T. asperellum and T. gamsii (Remedier®) are not effective for sclerotia/apothecia control. The usefulness of P. chrysosporium depends on the development of substrates capable of promoting its growth over soil microorganisms. Van Toor et al. (2005) found that wood rotting fungi as Phanerochaete cordylines or Pycnoporus coccineus and pine mulches enhance parasitism of C. camelliae sclerotia in vitro. However, as with P. chrysosporium and Remedier®, their effectiveness for the control of CFB under field conditions has not been demonstrated. Figure 10. 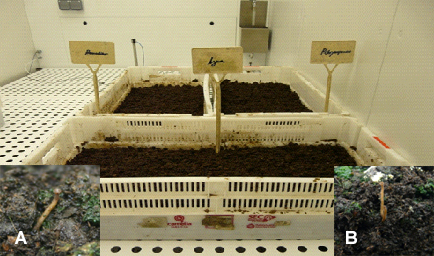 A, B, experimental plots (0.5 m2) sowed with sclerotia to assess the effectivity of BCAs (P. chrysosporium and Remedier®) against sclerotia germination. 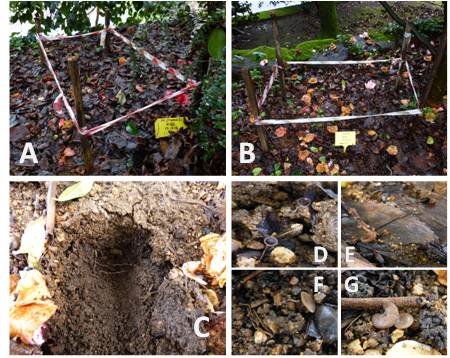 C, 4 months later, a suitable colonization of the BCA was not observed in soil (15 cm deep pit). D, E, F, G, an average of 23 apothecia per plot was recorded. No significant differences between BCAs-treated and control plots were recorded. The results of the tests indicate that it is difficult to develop a truly effective strategy to control CFB. Tests show that there are in vitro methods to break the cycle of the fungus (inhibiting the germination of ascospores, the growth of mycellium or reducing the viability of sclerotia). However, all ex vitro tests failed in controlling the disease. The camellia flower opens slowly and gradually, so the effectiveness of the fungicide spraying is limited. In addition we found that the mobility of fungicides is very limited in shrubs and camellia flowers. The thickness of the protective outer coating limits the action of BCAs. Although P. chrysosporium can degrade it, a long period of exposure is required for its effectiveness. However, under field conditions, the P. chrysossporium growth rate is not competitive as compared to other soil microorganisms. As a result, the fungus does not have enough time to degrade the protective outer coating of a significant number of sclerotia. BCAs as Trichoderma sp. have not proven effective against any stage of the life cycle of C. camelliae. On the other hand, the usefulness of endophytic bacteria as B. mojavensis is limited by its ability to colonize intercellular compartments of the camellia flower tissues. In view of these limitations, it seems that the genetic improvement of camellias may be the only way to control CFB. Authors would like to thank the Spanish Camellia Society and the Pontevedra Provincial Government for their material and economic contribution to this work. This study has been performed by the team of the Plant Biotechnology Unit at the Plant Pathology Service Estación fitopatoloxica do Areeiro. Authors wish to thank Alicia del Carmen and Cristina García Marín for their valuable technical support. Backman P.A. and Sikora R.A. (2008). Endophytes: An emerging tool for biological control. Biological Control 46:1–3. Bacon C. W. and Hinton D. M. (2001). Control of seedling blight in wheat by Bacillus mojavensis. USDA, ARS, Russell Research Center, Athens, GA. Phytopathology 91:S4. Publication no. P-2001-0025-AMA. Bacon C. W. and Hinton D. M. (2002). Endophytic and biological control potential of Bacillus mojavensis and related species. Biol. Control, 23: 274–284. Bacon C. W. and Hinton D. M. (2007). Potential for control of seedling blight of wheat caused by Fusarium graminearum and related species using the bacterial endophyte Bacillus mojavensis. Biocontrol Sci. Technol., 17: 81–94. Butler M. J. and Day A. W. (1998). Fungal melanins: a review. Canadian Journal of Microbiology 44: 1115-36. Guest D.I., Pegg K.C., Whiley A.W. (1995). Control of Phytophthoradiseases of tree crops using trunk-injected phophonates. Hort. Rev.17:299–330. Mansilla JP., Salinero C., Pintos C. 1999. Ciborinia camelliae Kohn, hongo causante del marchitamiento de la flor de camelia. Xunta de Galicia, Conselleria de Agricultura, Ganadería e Política Agroalimentaria, 16 pp. Montenegro D., Aguín O, Salinero C., Mansilla J.P. (2010). In vitro effect of four biofungicides on control of Ciborinia camelliae Kohn. International Camellia Journal 42:79-83. Percival G. C. and Boyle S. (2005). Evaluation of microcapsule trunk injections for the control of apple scab and powdery mildew. Annals of Applied Biology. 147(1):119–127. doi: 10.1111/j.1744-7348.2005.00019.x. van Toor R.F. (2002). Development of biocontrol methods for camellia flower blight caused by Ciborinia camelliae (Kohn). Ph. D thesis, Lincoln University, New Zealand. van Toor R. F., Jaspers M. V., Stewart A. (2005). Wood rotting fungi and pine mulches enhance parasitism of Ciborinia camelliae sclerotia in vitro , New Zealand Journal of Crop and Horticultural Science, 33(4):389-397, DOI: 10.1080/01140671.2005.9514375.